Polypharmacy is a marker of potential problematic prescribing. In clinical practice, defining polypharmacy purely by a specific number of medicines does not acknowledge that the potential risk of adverse effects of medicines can vary widely. Polypharmacy is a marker of potential problematic prescribing. In clinical practice, defining polypharmacy purely by a specific number of medicines does not acknowledge that the potential risk of adverse effects of medicines can vary widely. However, for the purposes of reporting on polypharmacy, it can be defined as the prescribing of five or more concurrent medicines, and excessive polypharmacy as the prescribing of ten or more concurrent medicines. This report provides an update on polypharmacy over a 12 month period (July 2013 – June 2014). An individualised assessment that includes a review of the need for each medicine can simplify treatment regimens and reduce the potential for harm. “De-prescribing” may be the best clinical decision for some patients and result in significant clinical benefits. It is increasingly recognised that health outcomes for patients are improved when one prescriber takes responsibility for all of a patient’s medicines. An important reason for this is that as the number of prescribers increases, so too does the risk of problematic prescribing and adverse medicine reactions. Patients with polypharmacy are more likely to have multiple prescribers than those with few medicines. Asking patients if they have visited another health professional is a simple way of checking if their medicine regimen may have been altered. 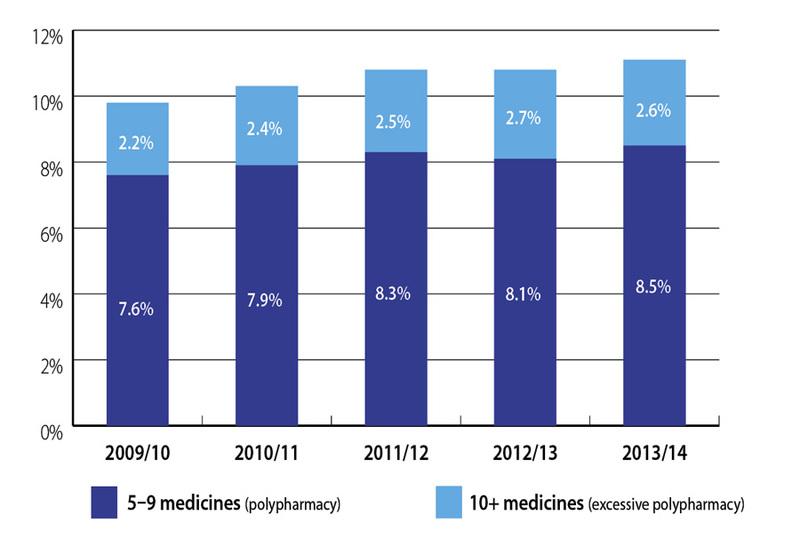 Over the last five years the proportion of the population experiencing either polypharmacy (five medicines) or excessive polypharmacy (10+ medicines) has continued to increase with >11% of the population having five or more medicines between July 2013 and June 2014 (Figure 1). These proportions have increased in all age groups over the last five years. While there are no criteria for optimal performance, this report is intended to help you benchmark your practice in relation to national data on polypharmacy. It may highlight some target groups who could potentially benefit from a medicines review or be used as a starting point for peer discussion around polypharmacy in your practice (Table 1).